Barah Aana revolves around three people living in the slums of Mumbai's [Images] Dharavi. They live a difficult life. Vijay Raaz [Images] works as a watchman in a building. He's upset with his job, as he is asked to run errands as well. Arjun Mathur is a waiter, and in love with a regular customer (Violante Placido). 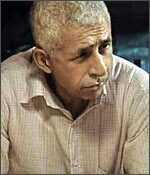 Naseeruddin Shah [Images] is a driver, who is always abused and accused of robbery by his employer's wife. Things changed when one day, Vijay Raaz's son falls ill at his village. Raaz is in dire need of money, and goes door-to-door in the building where he works for help. But nobody helps him. Thanks to an unexpected incident, Raaz ends up kidnapping a man, and earns Rs 30,000 ransom. He convinces Arjun and Nasser to earn money the easy way, and they start kidnapping for small ransom amounts. Until, they decide to commit the one last, big crime. Do they succeed? Watch the film and find out. Barah Aana is not as comical as the makers make it out to be. The film highlights the sorry plight of the three protagonists, who are very unhappy with their lives. The second half, however, brings a smile to your face on a few occasions. The story is simple and short, yet, it tends to drag on and on. Brick Lane actress Tannishtha Chatterjee does not have much of a role; all she has to do is flirt with Arjun Mathur. Viloante Placido, as an opportunist firang drug dealer, performs well. Arjun Mathur, last seen in Luck By Chance [Images], has potential and may have a promising film career. Naseer barely has one or three dialogues in the film even though he has the most screen time. But his excellent facial expressions make up for it. But it is Vijay Raaz who steals the show. His change of attitude -- from a man scared of losing his job to a man who learns how to make a quick buck -- is excellent. The film has no songs, helping the story move along well. Overall, the film is worth a one-time watch.